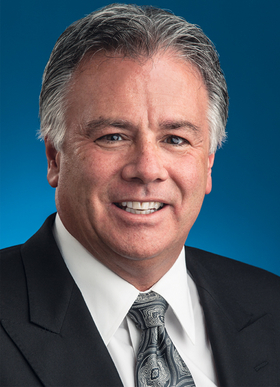 Lawrence Inserra Jr. is the board chairman of Hacksensack (N.J.) University Medical Center. Lawrence “Larry” Inserra Jr. has been around hospitals a long time, much of it for the same reasons nobody really wants to be around them. First, he spent two years trying to help his brother in his battle with leukemia. After his brother died at age 28, Inserra might have seen enough, but it wasn't over. About 25 years ago, Inserra's 5-year-old son, also named Lawrence, was diagnosed with Hodgkin's lymphoma. This time, the care would come not far from where Inserra's family lived in northern New Jersey. On a recommendation, Inserra's then-wife took their son to what is now Hackensack University Medical Center. The ending was happier as well. Lawrence survived his fight with cancer. A few years later, when someone asked Inserra if he was interested in serving on the medical center's board of governors, he jumped at the chance to help out at the institution where his son was treated for lymphoma. Inserra, who runs his family's grocery store chain, joined the HUMC board in 1995. Since then, he has pushed to keep the culture that made care so much easier during his son's battle with cancer. The hospital, meanwhile, remained a central part of Inserra's personal life—his daughter, Lindsey, was diagnosed with diabetes at age 11 and received treatment there. Both of Inserra's parents, now deceased, also were treated for cancer at HUMC. Now, more than two decades after he joined the board, the hospital has grown tremendously. The 775-bed not-for-profit teaching facility is now the flagship of a major New Jersey hospital network. It is the state's largest provider of inpatient and outpatient services. The hospital and its parent company, Hackensack University Health Network, have since started a medical school with Seton Hall University. And the network is seeking to merge with Neptune, N.J.-based Meridian Health, which would make the resulting company the largest health system in New Jersey, with more than $3.4 billion in revenue. But all along, Inserra, now HUMC's board chairman, has thought back to his own family's experiences and pushed hospital officials to remember the organization's basic mission. “We wanted to make sure that we kept patients first, always,” Inserra said. In recognition of his achievements on the board of Hackensack University Medical Center, Inserra is the recipient of Modern Healthcare's Excellence in Governance Award for trustees of large provider organizations. Inserra, 58, who now lives in Mahwah, N.J., is chairman and CEO of the family business, Inserra Supermarkets, which serves northern New Jersey and southeastern New York state. He appreciates not just his own family's experience at HUMC, but the central role it plays for other residents of northern New Jersey, where his family has lived for four generations. The patient-first culture isn't the only reason locals appreciate Hackensack, Inserra said. He said the feeling that it's a community institution rather than some corporate entity comes from how it operates financially and its high level of charity care as well. Inserra, who is also a major donor to the hospital, said the rest of his family is heavily involved in HUMC as well. His son, Lawrence, is now on an advisory board at HUMC's affiliated children's hospital, and Lindsey is involved with diabetes research foundations, co-founded by the Inserras, that support patients and families there.